1. Log in as an administrator and in site's home page select ‘Site Actions’ ---> then ‘Site Permissions’. 2. 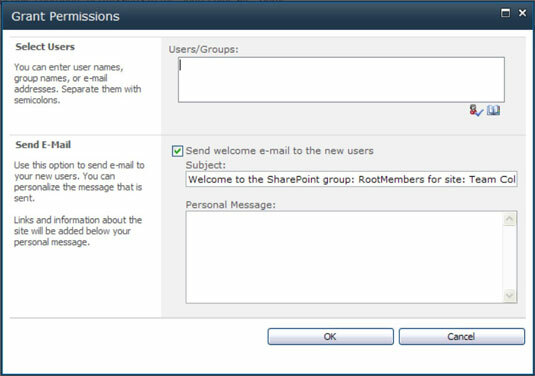 Once we open a list of SharePoint groups will appears in that select your members group for your site and click on it. 3. Once we open a list of the users who are already added as group members will appears. 5. In the Select Users section, type the names of individual user accounts or domain groups in the Users/Groups text box. Type the names in the form of domain\account. For example, if your domain name is SP and the domain group name is Employees, type SP\Employees. If you don’t know the names of user accounts, you can type the e-mail address. SharePoint tries to map the e-mail address for the account. For example, the e-mail address employees@sp.com resolves to SP\Employees in my domain. Chances are you can use the e-mail addresses from your address book in Outlook. 6. To search for user accounts, click the Book icon. Use the Select People and Groups dialog box to select user accounts. If you can't find the accounts you need, check with IT for assistance. 7. Click the Check Names icon to resolve the account names with the identity management system. The Check Names icon is the check mark icon below the Users/Groups text box. When you click this icon, SharePoint tries to find the user account in the identity management system, such as Active Directory (AD). If SharePoint can’t find the user, you can’t add the account. If the names won’t resolve, see IT for assistance.